Salty, sweet and spicy best describes this enticingly delicious party mix. 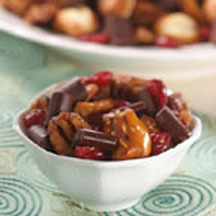 This exotic snack mix features oven-crisped pecan halves, chunks of semisweet chocolate and dried cranberries seasoned with the essence of vanilla bean and a flurry of curry-typical spices. Bring water to boil in large saucepan. Pour nuts into boiling water. Boil for 1 minute; strain. Pour nuts into large bowl. Add sugar and oil; stir to coat. Let stand for 10 minutes. Split vanilla bean in half lengthwise and with edge of knife, scrape inside of bean into a large bowl. Add spices to bowl; combine well and set aside. Bake nuts, stirring often, for 30 to 35 minutes or until nuts are light brown and crisp. While still warm, carefully pour nuts into spice mixture and toss. Spread spiced nuts in a single layer on clean, large baking sheet with sides. Cool completely. Pour cooled nuts into large bowl. Add pretzel nuggets, chunks and cranberries; mix well. Store in airtight container at room temperature for up to 2 weeks. Makes 10 cups or 40 (1/3-cup) servings. Recipe and photograph are the property of Nestlé® & Meals.com, used with permission.